The Internet in Cuba: A new undersea cable -- landing in Cuba? A new undersea cable -- landing in Cuba? Having two landing points in western Cuba would significantly reduce the load on today's backbone. Phase 1 routes around Cuba, phase 2 connects Cuba. As shown here, Deep Blue Cable is planning a Caribbean cable. Phase one, the solid line on the map, bypasses Cuba but phase two shows two Cuban landing points. The phase two cities are not shown, but one appears to be near Havana and the other near Playa Girón. The phase one route survey is underway. Cable installation will begin in September 2018 and it is scheduled to be ready for service in December 2019. They did not give a schedule for phase two, but having two landing points in western Cuba would significantly reduce the load on today's backbone. 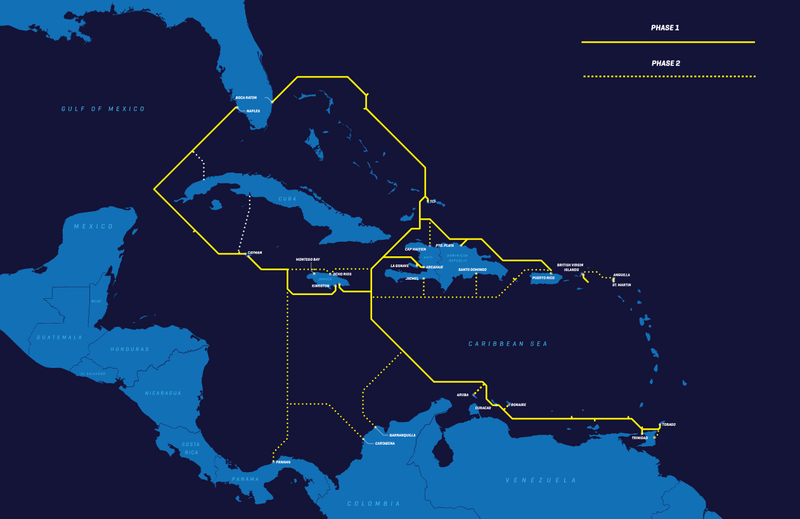 Traffic from Camagüey, Holguín, Guantánamo, and Santiago de Cuba could continue being routed over the current undersea cable at the east end of the island and traffic from Havana, Cienfuegos and other western locations would be routed through the new landing points, increasing speed and freeing Cuban capital for connecting smaller cities. After leading a delegation to Cuba in January 2016, Daniel Sepulveda, Deputy Assistant Secretary of State and U.S. Coordinator for International Communications and Information Policy, said there were at least a half-dozen proposals for cables between Cuba and the US, but that is the last I have heard of those proposals. The cable connecting the US base at Guantanamo to Florida could one day be turned over to Cuba, but even if that were to happen it would not alleviate the backbone load since it lands at the east end of the island. I have long advocated Cuba investing in interim, stopgap Internet connectivity in the short run while planning to leapfrog current technology using next-generation technology when it becomes available. This cable could be a major component of that next-generation Internet.